Today I added the finishing touches to these two dolls. I made a sunbonnet of antique double pink calico for the doll in the pink dress (the pink and white check is also an antique fabric). 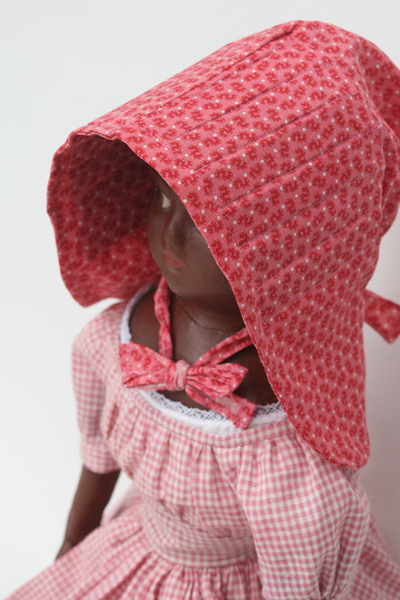 The bonnet is a doll sized version of an antique bonnet in my collection. The brim is stiffened with individually cut strips of cardboard. For her sister I fashioned an apron out of scraps of an antique “cheddar” print fabric. I also made her a necklace of coral colored beads. 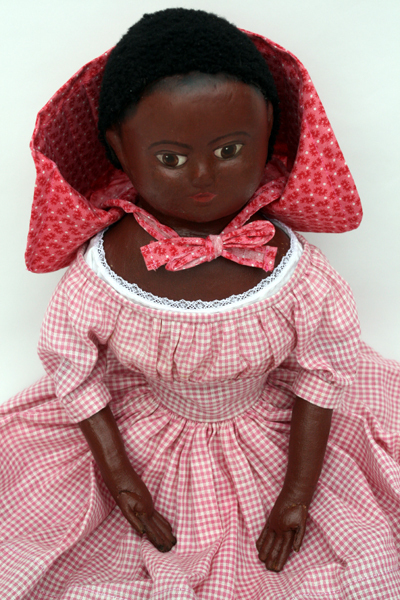 Both girls have chemises, pantalets, antique petticoats, and wigs made from lambskin just like Izannah’s black dolls had. They are each holding handmade Valentine’s. Please call for additional details or to order. 860-355-5709 Paula@asweetremembrance.com.